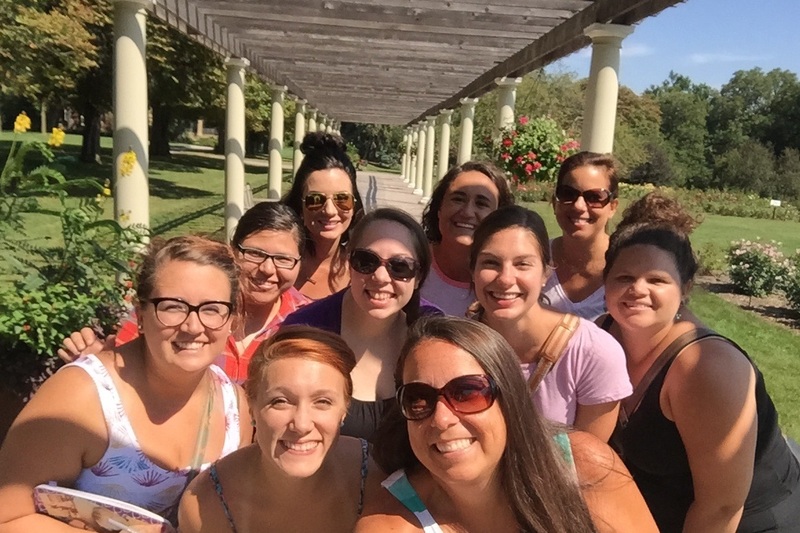 This summer I participated in an amazing professional development with the Illinois Writing Project. For twelve days, we learned about ourselves as writers and about how to be writing leaders in our classroom and our school. On one of those days we participated in a writing marathon. My school’s literacy coach, Michelle, and I knew this was something that we needed to take back to our school. 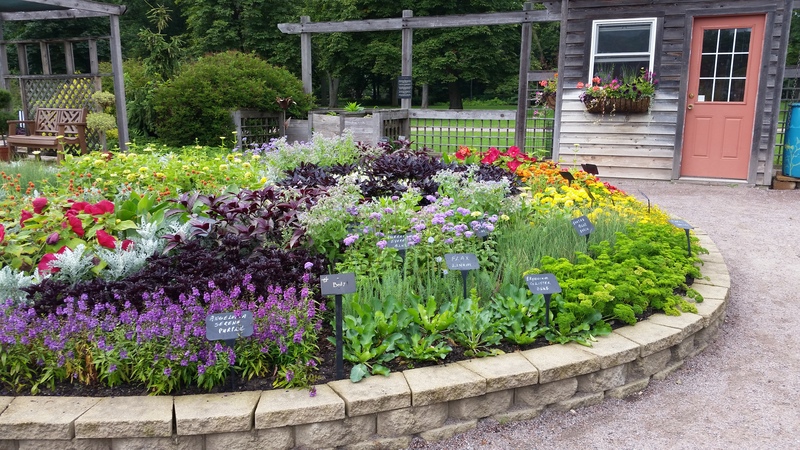 This past Thursday, Michelle and I met at a the beautiful Cantigny Park with eight of our colleagues. (five returning, five new) We were able to introduce this strategy and build relationships at the same time. Teachers learned about each other and about writing. One observation made was that sometimes we talked to each other during the independent writing time, but that was alright. It gave us ideas to write about. Maybe a completely silent independent writing time isn’t necessarily realistic? Maybe we need to allow students to wander when they hit a writing block? Maybe we need to give them opportunities to write in places other than their seats? Food for thought. There were also times that something one person said during a share led to the writing of someone else during the next stop. It just shows that share time is so important. It is often the part of writing workshop that is forgotten or eliminated for lack of time. However, it can generate so many ideas! During the fall, with lots of fall colors! Practice in the field and at the park before the event. Students need modeling and practice on how to use the environment for inspiration. 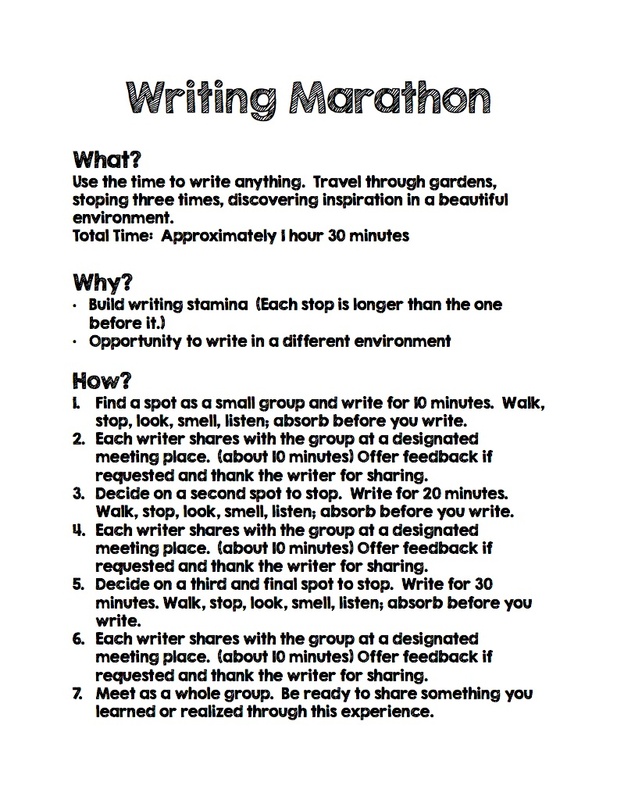 Generate a list of ideas in their notebooks before the marathon. On the marathon field trip, bring parents willing to write with us. You can expect a post later this fall about how this went over with third graders! I can’t wait! Write on! I’ve been reading a lot of advice for new teachers and I keep reading warnings about themes and Pinterest classrooms. The common idea seems to be these take time and detract from the important things – like curriculum and student learning. Here’s the thing – I love themes and I love Pinterest. My classroom will be filled with Pinterest finds. 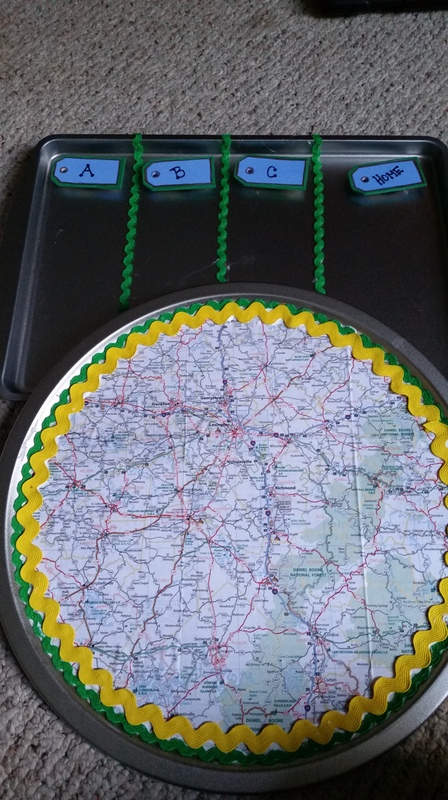 Crafting, Pinterest, themes – they make me happy. And the reality of teaching is I spend a lot time at school. At least eight hours a day, five days a week. A minimum of 1,408 each school year. (This is a very very low estimate.) If I’m going to spend that much time in a room, I want to make it a happy place. While every other decision I make throughout the year is based on the kids and their needs. But, the theme and the beginning of the year Pinterest-ing is what I do for me. I don’t make a bunch of anchor charts. I don’t label the kids’ lockers. They make those. But, I do craft my heart out. This year’s theme…Travel. Themes are necessary to my happiness. I am not an everything needs a place kind of person, but I am the everything needs a theme person. Every party. Every classroom. Themes are a necessity. So, my point is there need to be two warnings…one for new teachers and one for school leaders. New teachers: Beware of falling into a pit of unnecessary work. 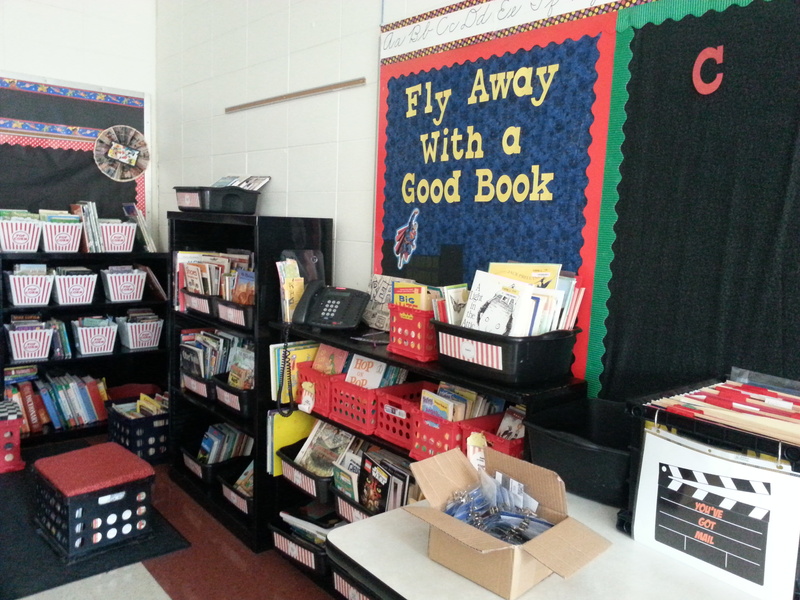 Themes and Pinterest crafts are not necessary for your classroom to be a welcoming place for students. Charts should be made with the kids. Students need to be a part of creating the physical environment. You may notice this post is much longer than anything I have written and that is because I didn’t write it. I tried to write a letter to new teachers, but it just didn’t come out. However, my amazing friend and colleague wrote an amazing one to share with the new teachers at our school this year. 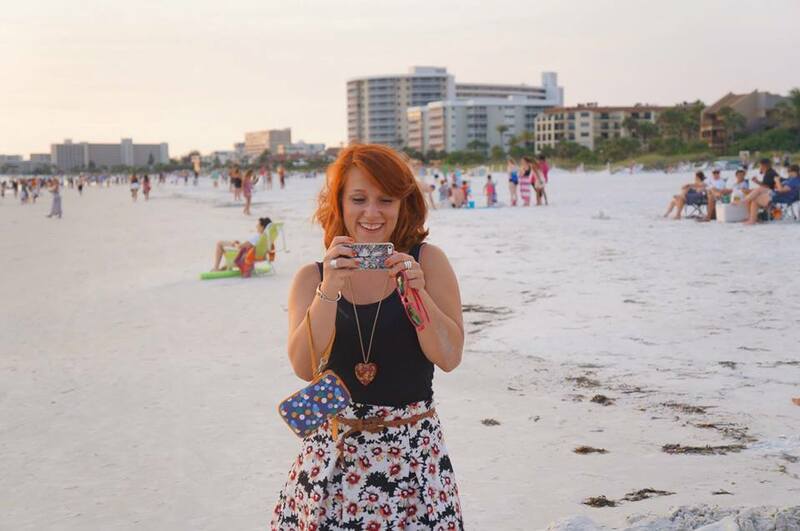 Amanda is a second year teacher and her dedication is obvious through this letter. Who better to give first years advice? You may find it silly, but I spent hours putting clear tape over everything only to spend more hours taking it off. Take the advice and don’t mess up like me…use contact paper instead! If you have word work built into your writing block, put it at the end of the writing lesson. I tried placing word work at the beginning of writing, but it ended taking more time out of writing. Bah humbug! Be wise and put it at the end! Okay, this one may be obvious… Keep student work examples, like reading and writing notebooks. You can use student work as examples for future classes, to help demonstrate what you are/are not looking for, and to make the work more realistic and achievable for students. Oh! This one I have been working on a lot… It’s okay to NOT have student input during the modeling/mini-lesson. My mini-lessons would become not-so-mini when I ALWAYS tried to include students’ input. Keep it short and straight to the point; this will give students more individual time to practice the technique you are teaching. I am one of those overly exuberant teachers. You combine this with intense dedication and you’ve got a disaster. The first few months were tragic. I practically lived at school. Luckily winter break rolled around soon enough to give me a breather and to wake me up with the realization that I was crazy! Soon enough I would be too exhausted to even teach! Don’t overdo yourself! Prioritize and remember that Rome wasn’t built in a day. Even perfectionists like me have to realize this. Never be afraid to ask questions! I am naturally the question-student, armed with one thousand questions per second. Gratefully, I had a mentor that allowed and encouraged my flow of questions. What I learned along the way, from both my mentor and my peers, is that the question-student gets most of the answers at a quicker rate. In other words, you learn how to fix mistakes and how to better proceed. Again, a seemingly obvious piece of advice, but isn’t it funny how often we forget to follow this ourselves? Even if there’s a deadline, remember to give yourself a break: take a walk, grab a coffee with a colleague, take a nap, you name it! Personally, I prefer to get out a bit right after school; this way I am refreshed and ready to tackle difficult tasks upon my return. Hand out “Thank you” cards to colleagues and students. The weight of a simple thank you card is astounding. I got so caught up in school, planning, and grading, that although I had the intention—I never got around to it. 😦 This is certainly something I plan on changing this year. Organize your computer folders by subjects and topics/units within that subject. This will not only keep your computer clean, but your resources will be easier to find and therefore, easily accessible in future years. Use sheet protectors for reusable games, graphic organizers, fill-in-the-blanks, and so on. Simply use dry erase markers and an eraser (wet wipes) to clean the sheet when done. Students will be able to practice their math facts on chutes and ladders, fill in graphic organizers to practice retelling…the possibilities are limitless! 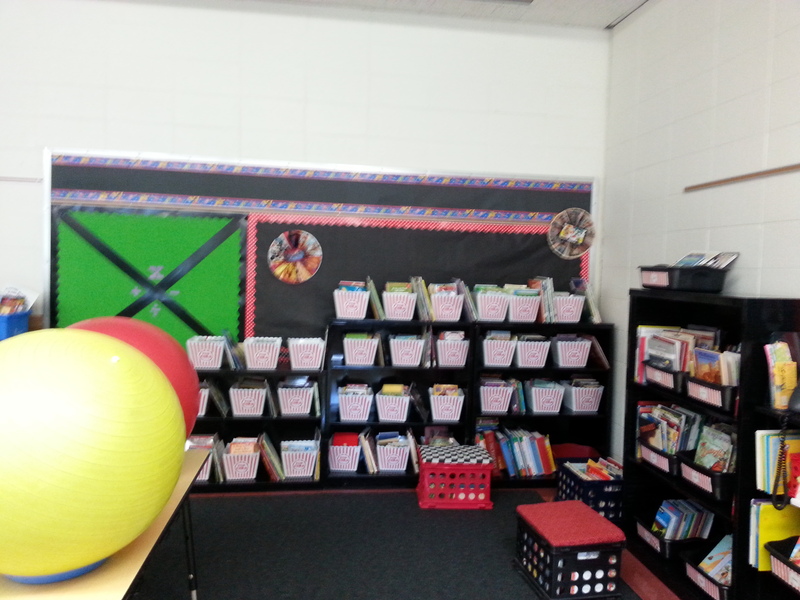 Figure out a system to organize and keep track of your classroom books. I could not decide which system I wanted, so I had a difficult time knowing which books were checked out and to whom they were check out to. 😦 Because of this, I could barely keep track of those books that I had purchased with my own money! Yikes! Don’t let this happen to you! Almost always construct anchor charts with students. Unless you MUST do it in advance because… well, I can’t even come up with a decent reason, besides making it look pretty… you should be creating these charts with your students. They’ll remember the information more when you do. When you think about it, is it the prettiness you want them to remember or the information? Information always weighs out! Post your reading group and writing conference order—and keep it visible! Great for both you and the students! This gives students a schedule to look forward to and depend upon and it also reminds you when you need to meet with each student. Praise the small and large achievements—and mean it! If you get excited when students make little successes throughout the day, they will get excited as well. Students will also be more willing to work for these smaller successes since they can see how much you notice and care! Contact Parents/Guardians on a regular basis. Parents need to know what’s going on in the classroom, the subtopics you’re covering, and the behaviors of their child—both bad and good. First you must decide which means is best for communication with your parents. Some may prefer email, while others prefer agenda planners. Secondly, write about the great moments your students have! This will help develop a deep and lasting relationship between you and the student and you and the parents. Let yourself be seen reading, writing, solving math problems, and so on. A lot of what we learn as humans is learned through watching someone else—observing another human modeling an action or characteristic and then putting what we observe into practice. We, like parents, are the ultimate models for students. Make sure you are participating in those essential activities too! Give feedback and give it often! Just make sure you are focusing on one task at a time! I made this mistake my first year—I guess I was a little eager! I thought the more I said, the more they would know and understand my thinking, but I forgot the obvious…it was overwhelming! Pick the MOST important task to focus on, make a goal, and work on improving it. Once you have achieved this goal together, you can either construct a new goal together or move onto the next task to improve. Better to give it a shot “your way” than wait for the “perfect” way. I am extremely guilty of doing this, especially as a first year teacher. I was so stricken with the fear of messing up that sometimes I just waited, put off whatever it was I wanted to accomplish, in hopes of finding the “right” way. I hate to break it to you—surely it broke me a bit too—but the majority of the time, there is NO “perfect” or “right” way. You need to use the information you do know to make your best judgment. Sometimes learning along the way is the best way there can be. Trial and error; think of Edison! I am still learning this too. Just remember when you DON’T try, you surely won’t succeed! Might as well give it a shot! Let students take the lead and teach. Whether the student is demonstrating how to solve a math problem or sharing a personal experience, both teacher and peers can learn a great deal from allowing students to take charge. This gives students a chance to share their thinking and their work. You will also get to know the students better through this methodology. Going along with the last one, don’t forget to be yourself! Let students see you cry when you’re upset, smile when you’re happy, and admit when you’re wrong (of course all in reason and moderation). My students know that I don’t know everything, that I am still learning too—and that’s okay! How can a student truly trust you and believe in you if you do not show emotion or never own up to being wrong? Believe it or not, students respect you much more when you are honest with them. As we all know, students learn by modeling. If you are not afraid to admit to being wrong, students will mirror this and therefore, will be more likely to take risks. Students will only take risks when they feel comfortable… so make them feel comfortable! Get to know and respect the students as people. This has to be one of my biggest pet peeves, so I apologize in advance if this one turns into a rant. Don’t forget, students are people too! They want to be heard, listened to, cared for, thought of, and respected. Wouldn’t it be terrible if the people most prevalent in your life only cared about your academic performance and would never listen to your deepest passions and darkest worries? I think so! It tells me that they don’t truly care. To show that you do care, take time out of your day to say a simple hello and ask them about their day. Stop by in the lunchroom, take a seat with them, and share a meal together. Showing these simple signs of affection goes a long way—of course you don’t have to do this every day (that would be a bit much)—but every now and then reminding your students that you value their thoughts, words, and presence like people. I cannot stress this enough! If you expect students to abide by your school and classroom rules, you need to follow them as well! This means not talking in the hallway (Ehhm! ), not working or talking during a presentation/assembly—you catch my drift. Remember, we lead by example. If you look around, the best students are likely to be those that follow the best examples: their teachers. Be the teacher you would want to have! The first day of the new year has come and gone. That first day I kept looking out at the kids and feeling like I was a substitute for someone else’s kids. These weren’t ours. These weren’t the faces that were supposed to be looking back at us. It was a hard transition to a new group of kids, but each day I find more and more things to love about these new kids. Last year’s group was very special, but these kids are special too. I just need to give myself time to see it. These kids sit down on the carpet for a read aloud without making me claustrophobic. They leave just enough room at my feet. So, while I see last year’s group pass in the hallway and miss them dearly, I am feeling more attached to this group by the moment. Slowly, they are becoming “our” kids. You spend way too much money and too many shopping trips to JoAnn’s, the Dollar Tree, and Walmart. 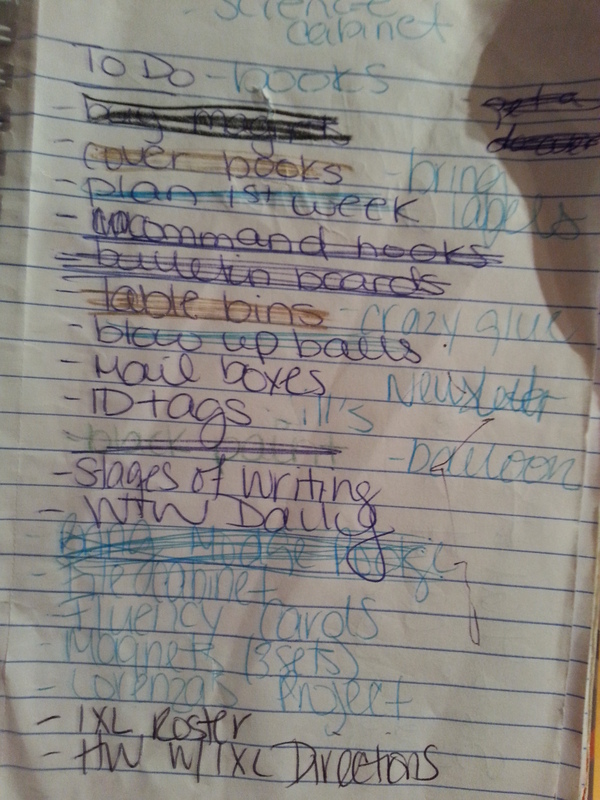 Your TO DO list looks something like this, more things being added than crossed off. You pull out your to do list at the movie theater during the previews of TMNT because things that need to be done keep popping into your head. You get 2-3 hours of sleep a night because you head is swarming with things that need to be done and things that could go terrible wrong. What else do you have? Please share! Ready or Not…The Kids Show up Monday! Since the kids are coming, we had to be ready. 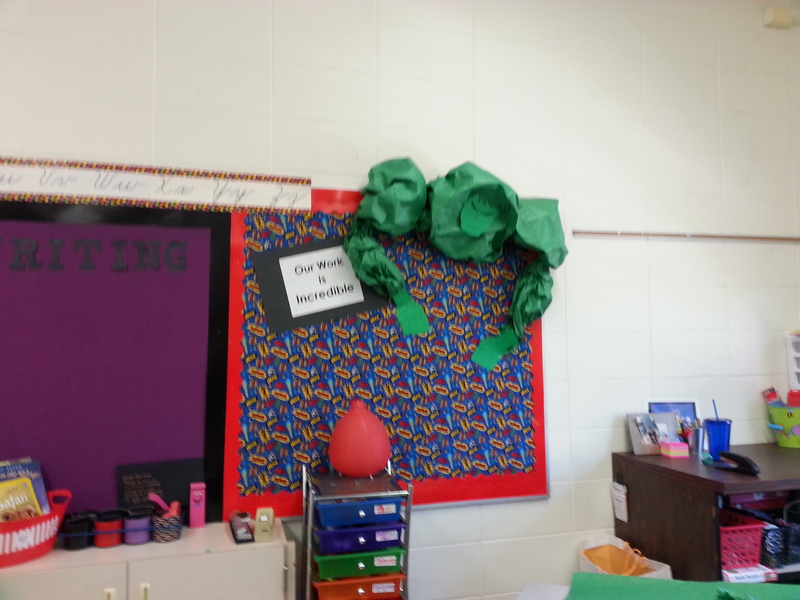 Our classroom reveal…Superhero theme. I am a theme person and I love making the environment I spend 8+ hours a day in pleasant and inviting. Crafting and Pinterest are my relaxation. 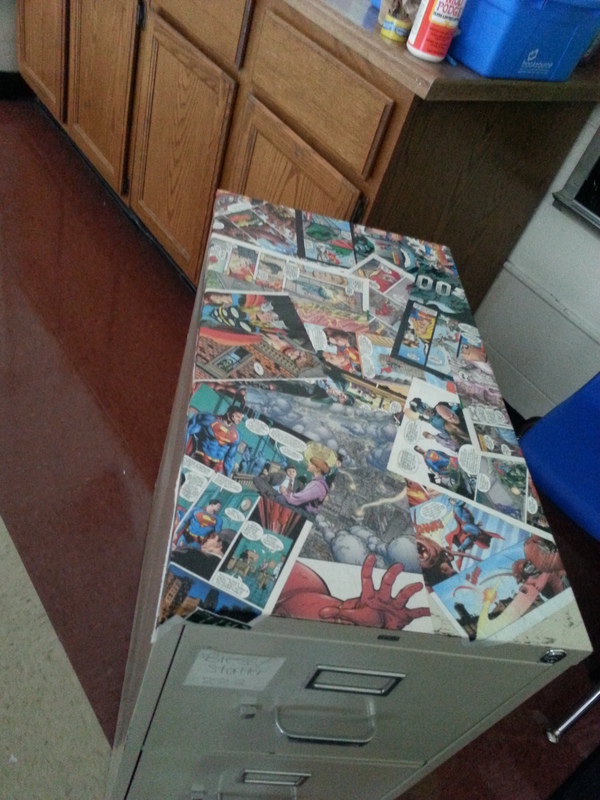 Our classroom library has popcorn bins from last year’s Hollywood theme. However, there are so many superhero movies coming out lately that it still works! We have the wall straight ahead separated by levels and the shelves on the right of the picture organized by genre. The crate seats are also filled with books! We are book hoarders! Students will eventually write short book recommendations and staple them onto the bulletin board. Sorry the picture is a little blurry! The Incredible Hulk! 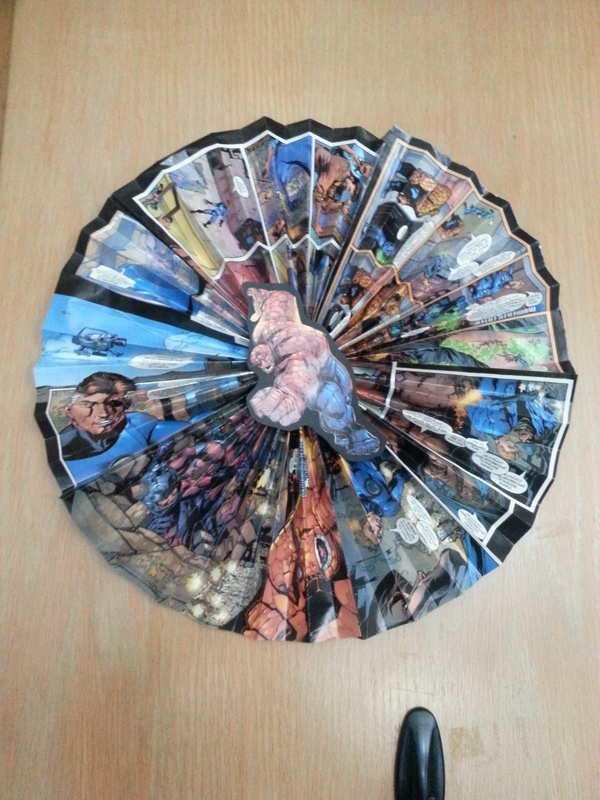 More clearance comic book crafts! 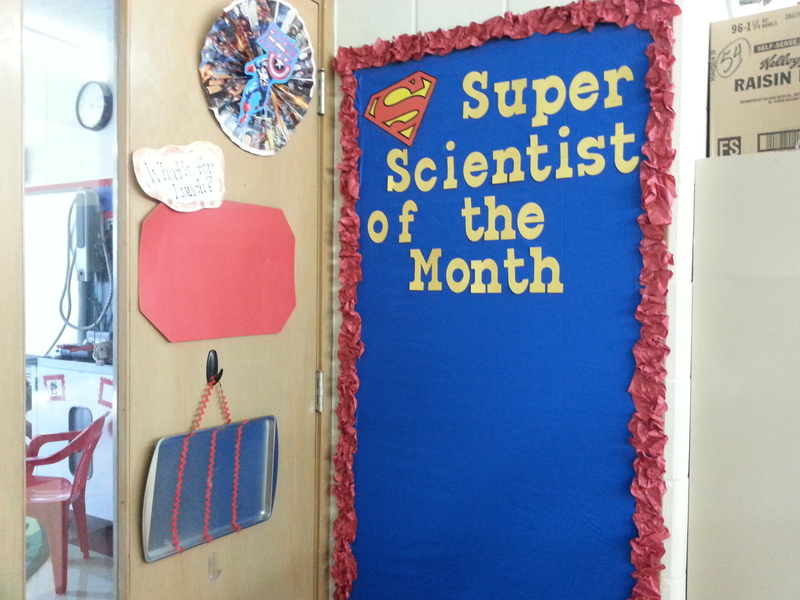 I’m going to put up the Super Scientist of the Month for September and then hand off the responsibility to select students. 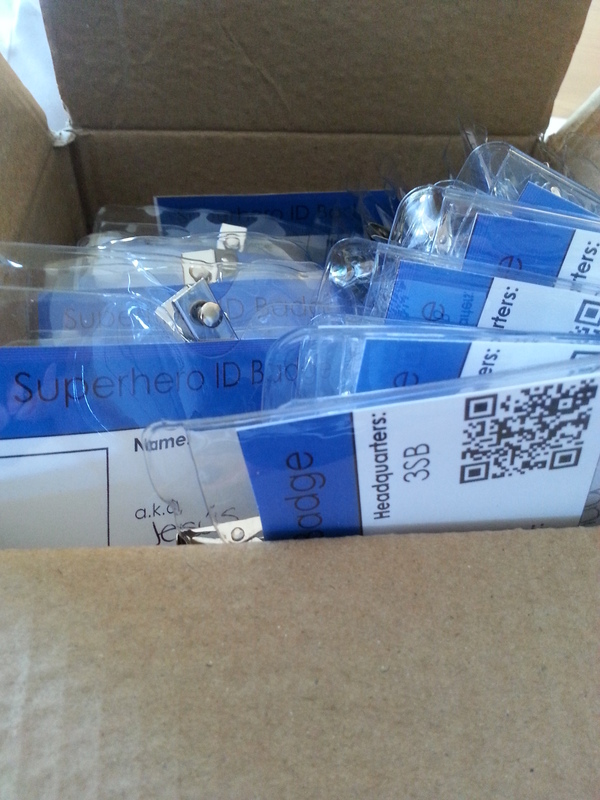 Last, but certainly not least, we will be handing out these super cool super hero badges to the kids as they arrive Monday morning. Here is the badge I made for myself. 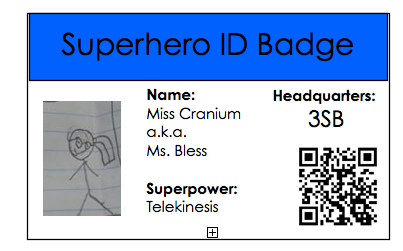 We put their name, but they will get to pick their superhero name and super power. The QR code will lead parents to our class Facebook page. (The drawing was done by a former student. Students will draw their own pictures.) Hoping this will get the kids excited before the day starts! 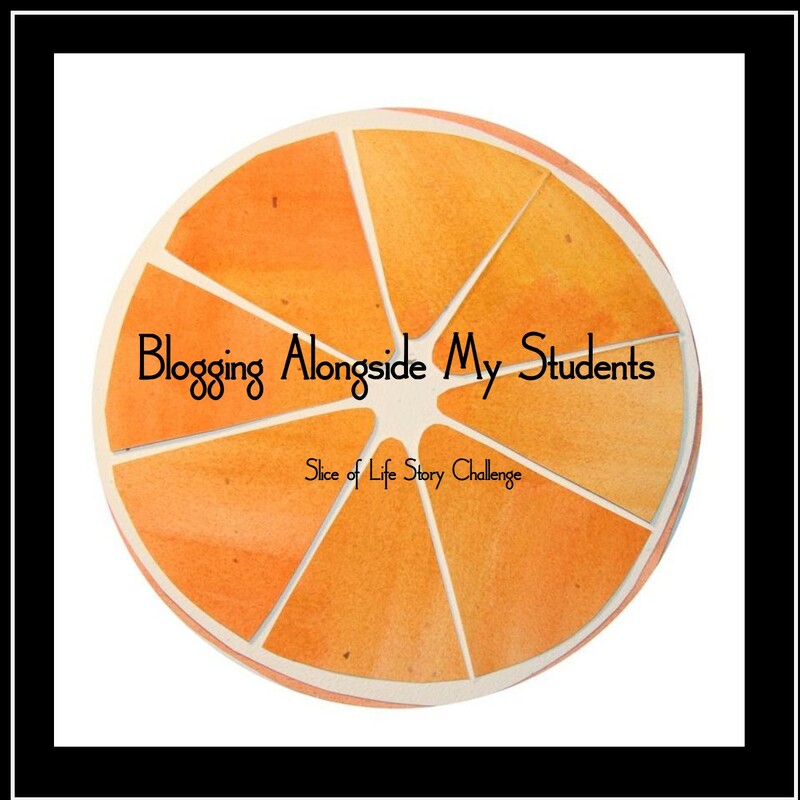 Posted on August 15, 2014 August 15, 2014 Categories Third GradeTags beginning of year, classroom library, classroom setup, classroom theme, DIY, Third Grade4 Comments on Ready or Not…The Kids Show up Monday!